This print (from a series of 4; see also E.27-2011) is related to Dixon's 'Regeneration' series of drawings (see E.26-2011). 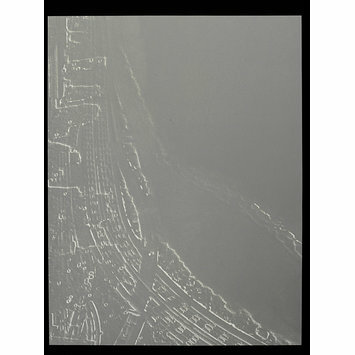 The prints are photo-etchings based on the artist's own manipulated photographs taken in present day Chicago (3 images) and Yokohama (1 image). The prints share with the drawings a range of ambiguous references and associations - they resemble aerial views of architectural remains, razed cities, or the vestigial traces of ancient buildings under the surface of a field, as seen from the air. In Regeneration II the tonal contrasts of the monochrome pigment give the image trompe l'oeil illusion of a tactile embossed surface. Regeneration IV, by contrast, is printed in a flat tone of grey on white in such a way as to suggest a process of revelation, of faint traces surfacing from beneath an effacing overlay. 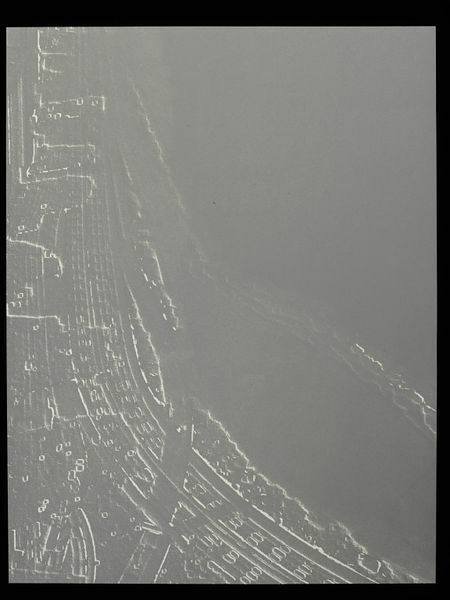 Print, etching, 'Regeneration IV (Chicago)', Jane Dixon, Cambridge, 2007.